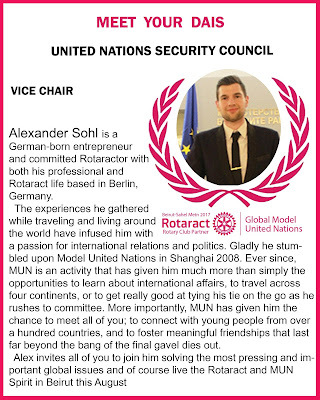 Meet your UN Security Council Vice-Chair, Alexander Sohl. He is a German-born entrepreneur and committed Rotaractor with both his professional and Rotaract life based in Berlin, Germany. The experiences he gathered while traveling and living around the world have infused him with a passion for international relations and politics. Gladly he stumbled upon Model United Nations in Shanghai 2008. Ever since, #MUN is an activity that has given him much more than simply the opportunities to learn about international affairs, to travel across four continents, or to get really good at tying his tie on the go as he rushes to committee. More importantly, #ModelUN has given him the chance to meet all of you; to connect with young people from over a hundred countries, and to foster meaningful friendships that last far beyound the bang of the final gavel dies out. Alex invites all of you to join him solving the most pressing and important global issues and of course live the Rotaract and MUN Spirit in Beirut this August.